German soldiers pass through neutral Belgium on their way into France. Britain has promised to defend Belgium's neutrality so they declare war on Germany and the British Expeditionary Force (the BEF) sets off for France. 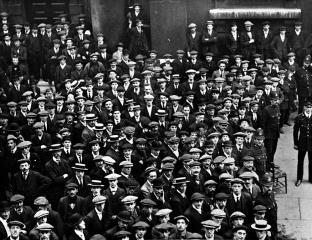 Young men across Wales volunteered to join the armed forces to help with the war effort. At this early stage, it was not yet compulsory for men to sign up.